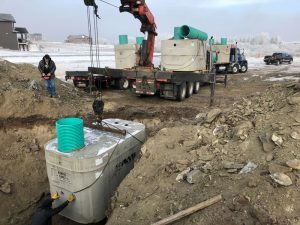 Titan Water Systems is your one call for all of your rural water needs: If you are building a new acreage home, we can plan out and install your complete system, from the well pump, the trenching, the pressure system and any required filtration. If you require stock waterers, cisterns, hydrants, we do it all. If it is water, it’s Titan. We pride ourselves in prompt service and are well informed, able to offer the most appropriate and cost effective solutions for your water needs. Cisterns are an effective method of managing your water. They provide the capability to turn a 1 gpm well into several days worth of high pressure water. There are myriad solutions and different design options. PVC cisterns in the mechanical room, buried concrete tanks outside, rain-collection tanks… we can walk you through the options and pros and cons to help you make an informed decision. Allow our expert installers the opportunity to set you and your livestock up with dependable, trouble-free automatic waterers. These systems provide your animals with year-round fresh water, no matter how cold and inclement the weather. There are several options and sizes depending on your herd and their demands. We will assess and provide you with solutions and accurate estimates, providing your stock with the water that they need. Pressure tanks and systems work together with the pump to create pressurized water throughout the home and property. Traditional pressure tanks are still very common and reliable, while more advanced constant pressure systems are also very popular, especially in new large homes. Once we know the flow of the well and the anticipated domestic demands we can size your system and provide options to maximize your water and ensure that you have the high pressure that you desire. While wells are vital to your property and provide water 24/7, they thankfully are relatively low-maintenance. Shock chlorinating your well and water system is a common practice that helps keep your well healthy and bacteria-free. There are other well-cleaning methods that Titan performs, depending on the condition of the well and severity of issues needing to be remediated. As well, we have the latest equipment for pulling and changing pumps, lines, underground repairs, or any other water-related problem… no matter how big or small the concern. If you are out of water, we will be there for you and will get you up and running asap! Want better water? Water wells provide water of all types of varying quality. Some aquifers are pristine water that require no filtration. Some are very hard and high in iron and will stain showers and toilets. Once we do a lab analysis or use a recent one that you provide, we can accurately diagnose the quality issue and provide the best solution to improve your water. Softeners, iron filtration, reverse osmosis, chlorine injection, ultraviolet sterilization, sediment filters, aeration… we do it all. Shock chlorinating your well and system is a low-cost very effective method of keeping your system healthy. This process eliminates harmful bacteria, keeps perforations open (ensuring that your flow stays optimized), freshens the taste, eliminates odour and helps keep your overall water system running at its best. Peroxide is another chemical treatment available, and we are always happy to provide info and help you feel comfortable with what process we determine is best. This is a very effective ‘deep-cleaning’ of your well. 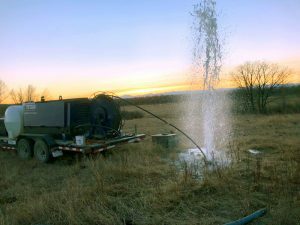 We pull the pump, then run lines into the well with jetting tools and blow out the well with our high capacity compressor unit. Flushing the well with chlorinated water, this thorough method of cleaning the well removes contaminants, sediment, iron bacterial sludge, and in extreme cases, rodents, birds and other infiltrators. Then upon completion the pump is inspected, re-installed and the water is ran until it is clean and clear. Pumps come in all shapes and sizes. It is important that they are sized properly to provide you with optimum flow and pressure, while not over-pumping your well. Years of experience allow us to properly size your system with the correct pump. Our service trucks are equipped with the latest technology to safely and efficiently pull and change pumps whether they are 50’ or 500’ deep. If you are out of water we can get there quickly to determine if the issue is a failed pump, pressure switch, wiring, or whatever the problem is and carry out the repair work immediately. We do what we can to ensure that our clients’ water is safe and clean, best serving their needs… and we do what we can to help maintain the aquifers to help keep these sources healthy and abundant for years and generations to come.